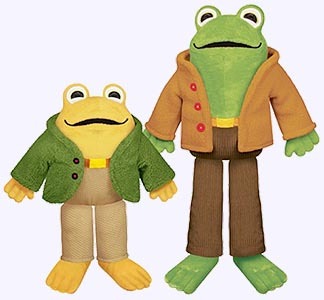 Frog is dapperly dressed in a warm carmel-colored coat, brown corduroy pants and a grosgrain ribbon belt. Toad is all snuggly soft in his lined furry jacket, tan pique pants and grosgrain ribbon belt. These stuffed amphiban friends are sure to please any child. Frog stuffed toy stands 12" tall and Toad stuffed toy is 9" tall. 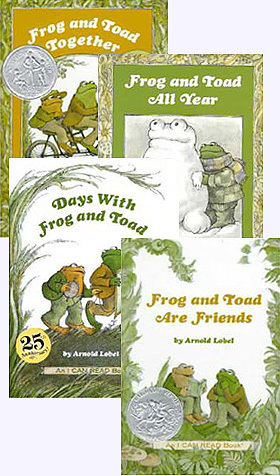 A slip-cased collection of three award-winning easy-to-read titles includes; Frog and Toad Are Friends, Frog and Toad All Year, and Frog and Toad Together. Paperback Picture Books in slip case. Ages 4-8. 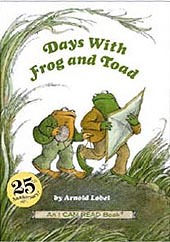 Note: Days with Frog and Toad is not included in collection. Paper-back is available separately below. Celebrate the 25th Anniversay of a timeless classic! 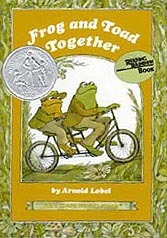 Good friends like Frog and Toad enjoy spending their days together. They fly kites, celebrate Toads birthday and share the shivers when Frog tells a scary story. Most of all they have fun together - every day of the year. Ages 4-8. One summer day Toad was unhappy. He had lost the white, four-holed, big, round, thick button from his jacket. Who helped him look for it? His best friend, Frog. Another day, Frog was unhappy. He was sick in bed and looking green. Who gave him some tea and told him a story? His best Friend, Toad. Ages 4-8. It was Christmas Eve. Toad's tree was shining, and dinner was ready. But where was Frog? 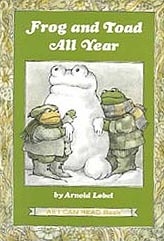 The two best friends were always together - taking walks in spring, eating ice cream cones in summer, sledding in the winter snow - what would Christmas be without Frog? A story for each season and a story for Christmas. Ages 4-8. 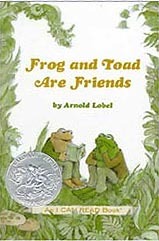 Celebrate the power of friendship with all four of the beloved Frog and Toad stories by Arnold Lobel. Hardcover Picture Book Set. Ages 4-8.